Prepared by former U.S. Rep. Cynthia McKinney (D-GA) for Atlanta Progressive News. This is a story of pure greed. I have visited the Metro Atlanta Task Force for the Homeless and believe that the City of Atlanta–its Mayor and City Council Members–should fight the system that produces homeless families, including homeless veterans. In the absence of such a fight, thanks to the generosity of donors, especially anonymous donors who paid the shelter’s $580,000 water bill, homeless families and homeless individuals, including veterans, have an embracing place to stay at the corner of Peachtree and Pine Streets in downtown Atlanta. That shelter is the Metro Atlanta Task Force for the Homeless. When I last visited the Task Force, a women’s shelter at the Gateway Center had closed its doors and so the administration area of the Task Force was filled with women thankful that the Task Force had not turned them down and children who were busy playing and probably not realizing the risky situation that circumstances and the City of Atlanta had thrown their way. Women and children are now a permanent fixture in the Task Force’s administrative area because the City of Atlanta has become the city too busy taking care of the greed of a few political actors acting on behalf of the already well-heeled. What kind of city elected official takes from the poorest of the poor in order to give more to those who don’t really need more? I have a different vision for the city of my birth; and I remember a different history. If Atlanta really is “The City Too Busy To Hate,” then please answer for me why so much hatred is thrown around against homeless people by the capricious policies of City of Atlanta? I used to feed the homeless every Thursday night in the parking lot adjacent to a downtown Church and did the Church complain? No! It was the City of Atlanta that complained that we were using their empty parking lot late at night and therefore they stopped our feeding plan that was done purely as a gesture of support for people who don’t get very much sympathy in the neoliberal dog-eat-dog world that elected officials seemingly have accepted, yet that I and many others reject. Neoliberalism–as shown by the pioneering work of Thomas Piketty–produces income inequality. President Barack Obama’s policy of the pursuit of neoliberalism and endless war, following on the heels of former President George W. Bush, has produced the worst income inequality the U.S. has experienced since its founding. The Black community has lost more wealth since 2001, accelerated by the “mortgage crisis,” than since the Trans-Atlantic Slave Trade. This “crisis” facilitated the theft of homes, especially of Blacks, by banks that used illegal means to steal them. And yet not one banker has been sent to prison for breaking the law. It is this fight against neoliberalism that shapes global politics today. It is this fight that is being waged by Venezuela, Cuba, Bolivia, and other countries whose transformational leaders are trying to find a way for an economics that places the community above the petty pecuniary interests of the greedy individual class. It’s a shame that we have such a struggle against policies that produce a result that is so obviously wrong morally. The greedy class are defined by their greed; and now they have a select group of politicians in tow. The banks have been enriched by the politicians who pander to them, which engenders more pandering, which results in yet more riches for banksters and job security for these politicians..
We have seen that the greedy, when given the opportunity by the City of Atlanta, will place eighty year-old Black people in ovens in the summer time (known as high rise buildings). Where was the oversight of this contract by the elected officials of the City? At a time when City of Atlanta taxpayers are bailing out billionaires so new athletic fields can be built, isn’t it incongruous that City residents would be asked to boil water before they drink it? Isn’t it time that we fundamentally change our mindsets and our political behaviors that fail to reflect both our interests and our transformative values? By that, I mean, isn’t it time that we stop supporting these pandering politicians and actually work for and support candidates who love the community and don’t just want a position? Nobody asked me, but I will offer my two cents’ worth, anyway: The City of Atlanta doesn’t need any more pandering politicians; and City tax dollars shouldn’t just be expected to flow so easily to a class so greedy that it would steal from the poorest of the poor. I welcome everyone’s opinion, but when you do not live in the neighborhood impacted, I say “Whatever”! 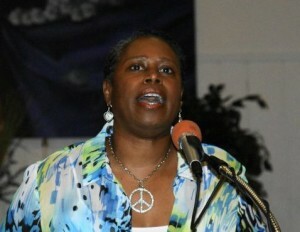 I am a full supporter of Congresswoman Cynthia McKinney. She keeps the most need to be discussed topics on the front burner and I totally agree with her regarding this Homeless issue. As they say in the “hallowed” halls of the U.S. Congress, I wish to associate myself with Dr. McKinney’s statements. Thank you, and right on! I appreciate the comments; and Renard, you are right. This is a situation that could be fully discussed by the people of the City and not just a few people in backrooms. I’m sure that a solution that reflects the values of the people of the City can be reached with the proper dialogue. In reading the Georgia Supreme Court decision, the shell-game economics engaged in by those who want to personally profit from the closure of the Task Force becomes very clear. Footnote #11 on page 12 of that decision even states that one individual–Emanuel Fialkow–could be liable for another crime, too. Why conspire privately to do what one is proud of? Why use shell companies if the effort is clean? In short, why not deal honestly? Isn’t it time out for for public policy that socializes pain while privatizing profit? This is win-win public policy that could be adopted in the City of Atlanta. In fact, in an open and collaborative way, we could begin to tackle all of the problems that trouble the City and its residents. I have the honor to serve as chair the board of directors of the Task, and I want to say thank you, Cynthia, for your support in this difficult time, for your long record of progressive advocacy, and for your insistence that we place the issue of homelessness in Atlanta in the larger context of the neoliberal counter-revolution that has caused so much social suffering amid so much speculative wealth. Thank you, Chuck! I appreciate your comment for sure! I also appreciate the work of the Task Force and hope to live long enough to see an Atlanta that doesn’t need ANY homeless shelters because we’ve regained our souls and revolutionized our values.